Ethiopia is pushing engineering education harder than any other country in Africa, creating challenges for its academics. Most new universities on the continent have a technology-for-development agenda. Last year Malawi opened the Malawi University of Science and Technology, while the Botswana International University of Science and Technology welcomed students to its new campus (Prism, November 2013). Ghana recently announced that it will convert 10 vocational colleges into technical universities by next year. As a region, sub-Saharan Africa has the world’s fastest growing higher-education sector, with enrollments up 170 percent over 12 years. But “Ethiopia is the most ambitious of all,” says Juma. The growing pains are most acutely felt in engineering laboratories, which were always underequipped and now are overcrowded as well. Electrical engineering student Meklit Tsegli describes how seven or eight people hover around each lab station, where “one person does the work, and the rest just watch.” In four years of engineering studies at Adama, she estimates she personally has performed 10 experiments. To accommodate the onslaught of civil engineering students at EiT-M – now far larger than any civil engineering department in the United States – labs operate seven days a week. When chemical supplies run out, students watch videos of experiments instead of performing them. The newer, regional universities are in particularly dire need of laboratory equipment. In Adigrat, a town with more horse carts and tuk-tuks than cars and trucks, Gebregziaher Asmelash sits with his back against the wall of an empty laboratory, studying his notes. The electrical engineering student is satisfied with his lecturers and proud to attend a university just down the road from his home. But three months into the academic year, he has yet to conduct a single lab experiment for any of his third-year courses. “Lecturers want to show us lab equipment,” he says, “but since there is none, they become angry.” At least he’s not one of the chemical engineering majors. They have no laboratory at all on the campus. University administrations are not entirely responsible for this problem. Just as the Ministry of Education has centralized control over the distribution of students, it also sources and supplies laboratory equipment. Teklehaimanot says that when the ministry budgeted for 13 new universities, including Adigrat, civil and electrical engineering received lab supplies first. Chemical engineering labs were put on hold, but the students were sent anyway. Equipment constraints are not the greatest worry for Alem Mebrahtu, Adigrat’s academic vice president. “The government is assigning a lot of money to education,” he says. “Our problem is a lack of staff.” Universities opened more quickly than Ethiopian engineers and educators could earn higher degrees. Most lecturers at Adigrat and many other new universities have only bachelor’s degrees. “They’re well-meaning people, but they’re not well-prepared,” says Astatke, who holds pedagogical workshops in Ethiopia each summer. Engineering schools are working frantically to upgrade their faculties’ qualifications, but in the short term this only exacerbates the dearth of lecturers. Each university keeps several staff members on the payroll even when they are earning graduate degrees abroad. ASTU has sent 40 of its academic staff to South Korea for Ph.D.’s. As a result, the student-faculty ratio is 40 to 1, twice as high as Lee would like to see it. Asian countries are less enticing locations for Ethiopian engineers to put down roots. And Germany actually pays Ethiopian engineering graduates to return home. After earning a Ph.D. in electrical engineering from Technischen Universität Darmstadt, Gebremichael Teame says he received 500 euros a month for two years – more than his salary – for returning to his teaching job at EiT-M. Noting that there are more Ethiopian Ph.D.’s in engineering outside of Ethiopia than inside, Astatke asks, “How can we tap into them?” He holds up as a model the Ethiopian-American physicians who regularly return for stints to practice and teach. Their group has raised $9.5 million to build a hospital in Addis Ababa. 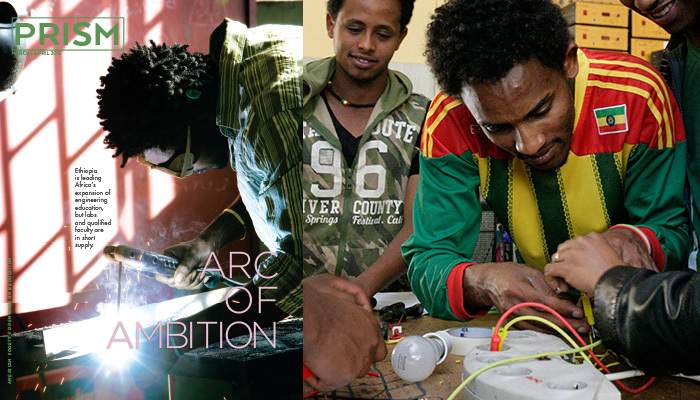 Astatke is trying to set up a similar organization to facilitate the flow of engineering talent back to Ethiopia. Faculty pay scales are one hurdle Lee must first overcome. Ethiopian academics are paid on a uniform national formula. Expatriates earn more, and many foreign lecturers – especially from India – help fill gaps in engineering departments. But Ethiopian-born professors must accept the lower scale for locals, no matter their years of overseas experience. Lee, who heads one of the country’s two science and technology universities, is pushing for the right to pay Ethiopian-Americans like expatriates. The true size of academic salaries is a matter of perspective, however. Ethiopia is one of the poorest nations in the world. Not surprisingly, its universities pay some of the lowest salaries, as tallied in Paying the Professoriate, a 2012 book by Boston College’s Center for International Higher Education. Even within Africa, Nigerian professors earned four times as much. Yet relative to a very low GDP per capita, Ethiopian salaries worked out to be extraordinarily high. AAiT’s Kim has a partial solution to the faculty shortage: online education. This year he is testing courses from the Korea Advanced Institute of Science and Technology (KAIST) with 100 students. Within three years he hopes to have 70 percent of classes online. The School of Electrical and Computer Engineering is in more of a hurry, with plans to reach the 70 percent mark by next semester. While the challenges of educating the “tsunami wave” of engineering students are slowly being tackled, less is known about the challenges that graduates will face when they hit the job market. Teame notes that when EiT-M was graduating 50 electrical engineers, all found jobs easily and employers were begging him for more. In the near future he will release 500 graduates, and “not all will find work,” he fears. Civil engineers enjoy higher levels of demand, since Ethiopia today resembles one giant construction site. But the government also is counting on engineering graduates to create their own jobs and accelerate industrial development in what has largely been an agricultural economy. Courses in entrepreneurship are being added to the engineering curriculum, and Adama’s Lee takes comfort in knowing that South Korea also trained large numbers of engineers before industries had arrived to absorb them. Some Ethiopian employers say they would take on more engineers if graduates were better qualified. In Addis Ababa, Girma Afework is making plans to hire some 30 engineers for his structural steel company, Gatepro Engineering. But he has requested permission from the government to bring some of them from overseas, since he cannot find local graduates with knowledge of computer numerical control. “They don’t have professors to teach this technology,” he says. On the wall behind his desk hangs a symbol of his concerns about the engineering education in Ethiopia: a framed copy of his son’s bachelor’s degree in engineering from George Mason University in Virginia. Still, GatePro’s growth is a sign that the engineering environment in Ethiopia is heading in the right direction. The expatriate engineers will train locals to take their place, and Afework will send other hires for advanced degrees in Addis Ababa while they work for him. A glimpse of a future of quality engineering education is on display inside one ASTU building. Kalid Ahmed, an energetic 32-year-old, heads the first materials engineering department in the country. Just a few years ago, while working toward his Ph.D. in France, he felt a world away from the universities he knew back home. “Seeing the labs, the infrastructure, the curriculum, I doubted we could have that in Ethiopia,” he recalls.